In my view, the rout in EM currencies is due for a sharp technical reversal. To understand this coming EM currency rally, we need to understand some fundamentals about foreign exchange markets in general. After decades of studying stock markets and foreign exchange markets, I’m amazed that most analysts still don’t see the fundamental difference between the two. In stock markets, movements are always absolute and may or may not be relative. In foreign exchange markets, movements are never absolute and are always relative. In short, stocks move up or down on an absolute basis, and in doing so they may or may not move up or down in sync with the overall market. Currencies are different. When analysts say the dollar is “up” or the dollar is “down,” what they mean is that the dollar is up or down relative to another currency. There is no absolute “price” of a currency. Currencies are always quoted as cross-rates compared with another currency or an index of currencies. Gold used to perform the role of the absolute measure for the value of currencies defined as a weight in gold, but that has not been true since 1971. You can still get gold quotes in various currencies, but forex traders, government officials and central bankers all but ignore gold for this purpose. At least until the return of a gold standard (don’t hold your breath), currencies are quoted as cross-rates. In practical terms, this means that one currency cannot go “up” without some other currency going “down.” It’s a zero-sum game. It’s also like a roller coaster ride with steep climbs, scary plunges and sharp turns that nevertheless ends up back where it started. In the past 20 years, the EUR/USD cross-rate has risen as high as $1.60 and fallen as low as $0.80. Right now EUR/USD is around $1.16, about in the middle of that 20-year range. EUR/USD did not move in a straight line from 80 cents to $1.60 and then back down again. In fact, there have been 10 reversals in EUR/USD of approximately 20% each over those 20 years. The euro today is right at the $1.16 where it opened in 1999. It’s just like that roller coaster ride — lots of thrills and chills, but it’s back where it started. The same is true for EM currencies versus the U.S. dollar. There’s plenty of reason to be bearish on EM economies and the long-term prospects for their currencies. Yet the recent plunge in EM cross-rates to the dollar has been driven almost entirely by Fed tightening combined with interest rate differentials and perceived creditworthiness. The Fed will have to reverse course soon, probably at their meeting in September. This does not mean the Fed will cut rates, merely that they will “pause” in the current course of rate hikes. By the way, this is exactly what the Fed did in 2017; they raised rates in March, June and December, but took a pause in September. A pause in rate hikes is a form of ease relative to expectations. Fed ease will weaken the dollar. When the dollar gets weaker, EM currencies must get stronger. That’s the zero-sum nature of cross-exchange rates. Getting into EM currencies now just as the Fed is announcing its most recent rate hike is an ideal entry point for the coming reversal and rally. 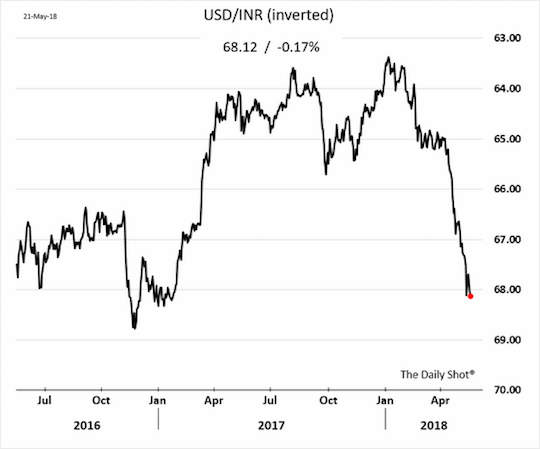 Emerging-market currencies are down and the press coverage makes it sound like armageddon. In the 2015/16 crash this broad-based ETF of emerging currencies fell by over 20%. This latest pullback amounts to a little over 5%, or about the same as the euro drop. Such negative sentiment on such a small move might be a good opportunity for a contrarian. How bad has it been lately for EM currencies? 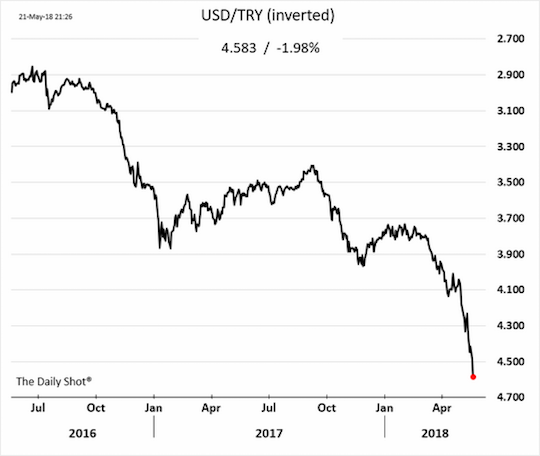 The price action and sentiment have been awful, as revealed in the three charts for the Turkish lira, Indian rupee and Brazilian real. Yet it’s precisely these cross-rate collapses that make EM currencies attractive right now on prospects for a reversal. I could provide many other examples, but you get the point. EM currencies are in free fall versus the dollar. But, as explained above, currencies don’t move to extremes in a straight line. They fluctuate for hundreds of reasons including headline risk, geopolitics, risk-on sentiment, interest rate differentials, hot money flows and carry trade potential. The dollar might be stronger a year from now, but it looks set for a drop in the next six months as the Fed takes a pause in its interest rate hikes in order to assess the impact of monetary tightening so far. When the dollar drops, EM currencies rally. It’s that simple. 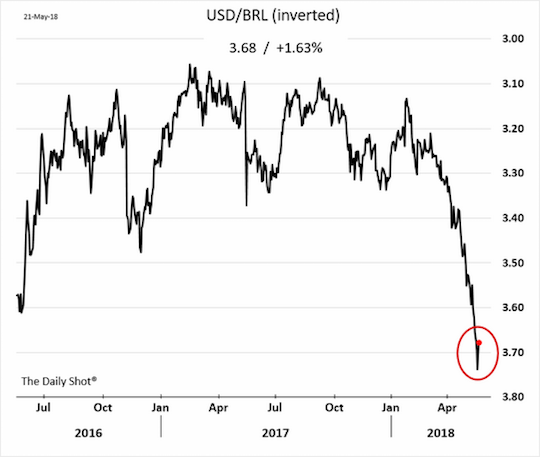 With this EM currency rout now behind us and a Fed interest rate pause ahead, what do my predictive analytic models telling us about the prospects for EM currencies in the near future? Right now EM currencies are oversold. This is due to unusual strength in the dollar due to Fed tightening. Current monetary policy in the U.S. is completely unprecedented. The Fed is not tightening because of economic strength. They’re tightening because they need to raise rates and reduce their balance sheet to prepare for the next recession. Raising rates into weakness has not been Fed policy since 1937. That policy ended in a severe recession and extension of the Great Depression. Reducing the Fed’s balance sheet by over 50% is completely unprecedented. It has never been attempted in the 105-year history of the Fed. Quite simply, the Fed has no idea what it is doing. The Fed is overtightening right now and does not even realize it. This means that easing is just a matter of time. And that easing is the signal for an EM currency rally. Just to be clear, there is good reason to be highly negative on emerging markets over the next year or so. Debt levels are too high, foreign exchange coverage ratios are too low and the EM export sectors are highly vulnerable to a slowdown in developed economies and China. Still, nothing moves in a straight line. The fact that EM economies and stocks might be weaker next year does not prevent a short-term reversal rally in EM currencies starting now. 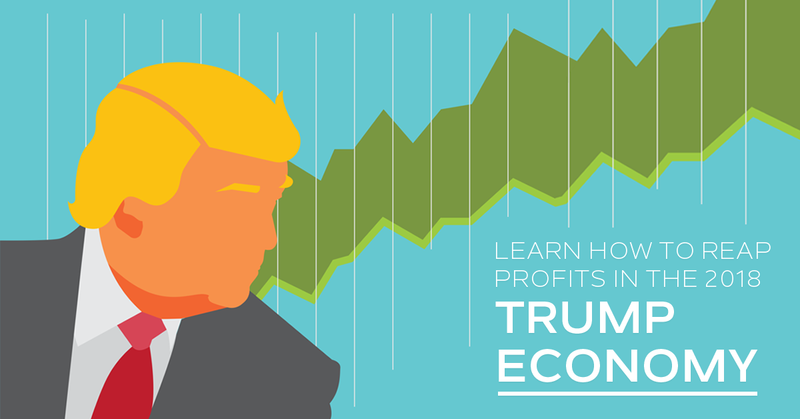 Want to learn how you can reap massive profits from this year's Trump Economy? Click here to get a free step-by-step guide to get started.